Canning 101. Simple steps for canning success. A popular preserving method is canning. 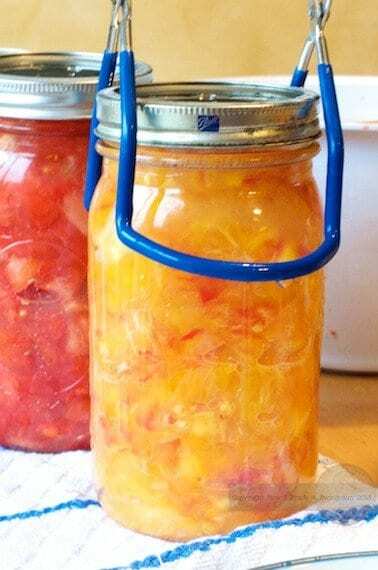 Canning heats the food, kills any microorganisms and creates a seal on a glass jar. Here is canning 101 or as I like to call it, canning for beginners. Learn about canning equipment, canning safety tips as well as canning dos and don’ts. Simple steps for canning success. Canning Jars Be sure they are canning jars. Glass jars do not = canning jar. Lids. These can not be reused from batch to batch. Get new lids. Rings These are used to keep the lids tight to the jars are they process in the hot water bath. Lid Wand This is essential for safely getting the sterilized lids on the jars with out burning your finger tips! Clean Cloth These are used to wipe the rim of the jar before the lid is applied. Large Pot A large pot that can accomidate canning jars PLUS 1-2 inches of water. Tongs or Jar Lifters ESSENTIAL for getting the jars out of the simmering water. Simple steps to water bath canning. Fill with boiling water, pickling liquid or juice. Wipe jar rims, add a FRESH lid and a ring. Process in a hot water bath for the recommended time. Remove from the water bath. You can customize your flavors. Home canning is one part art and a whole lot of science. Safety is of the utmost importance when canning. Here are some do’s and don’ts when it comes to home canning. These tips come right from Ball Jar. Follow a tested/approved recipe for home canning. Follow a tested/approved recipe completely. Clean jars prior to use. Make sure your canning pot is tall enough to cover the jars by 1-2 inches of water. Use the appropriate canner for your stovetop. Use a canning rack, trivet, or bands to place the jars on top of in the pot/canner. Remove one jar, fill jar, then place jar into canner before filling the next jar. Measure your headspace according to what’s indicated in the recipe. Remove air bubbles with a plastic utensil. Wipe the rim of the jar with a damp cloth or paper towel to remove food particles. Adjust the band to finger-tip tight. Adjust processing time for altitude. Start the processing time when the water begins to boil or pressure achieved. Allow jars to cool in canner for 5 minutes after processing before removing. Place preserved jars on a towel or wooden cutting board spaced 1-2in apart to cool. Allow jars to cool for 12-24 hours before checking the seal. Remove band, ensure lid is concave, & verify the lid is sealed before storing. Clean jar prior to storing. Store jars in a cool/dry/dark location between 50-70 degrees. Use an outdated recipe or untested recipe. Alter recipe ingredients, processing method, or processing time. Use a jar size larger than indicated in the recipe. Clean closures in a dishwasher. Use jars straight from the case. Use a pot that is too small for your jars. Assume you can preserve on all stove-tops. Place the jars directly on the bottom of the pot/canner. Place hot food in room temperature jars. Place hot jars on a cool counter-top or anything metal. Forget to remove air bubbles or use a metal utensil to remove air bubbles. Forget to wipe the rim. Use antique or one-piece closures. Crank the band on the jar super tight. Forget to adjust processing time for altitude. Start processing time when the last jar is loaded into the pot/canner. Remove jars immediately after processing or force pressure to come down. Don’t place hot jars directly onto a counter top or metal surface. Don’t forget to check your seal. Don’t forget to wipe the jar down before storing. Store jars in very hot or very cold locations is not advisable. Additional note: These are basic steps and more specific steps would be taken depending on what is being canned. Ensure the glass stovetop is safe for home canning. Use a pot that is completely smooth on the bottom & will come in complete contact with the heating element. The bottom of the pot must not exceed the burner by more than 1 inch.